The revised Datsun Go’s rear end is identifiable by the new bumper and a chrome lip at the base of the tail gate. While it is not a design detail, the rear wiper is also a fresh inclusion on the top-spec version. There’s no rear defogger, however. In all, the Go looks far more appealing than before, with the new Amber Orange colour also helping give the car a more youthful persona. The Datsun Go picks up pace smartly, but the engine runs out of steam at highway speeds. Cross 80kph and you’ll also sound off the speed buzzer – a new addition that will be required by law, come April 2019. The Go is not a car that you’d be inclined to drive much faster than needed, to begin with. The light body (it tips the scales at 846kg) tends to move about in crosswinds, and it isn’t as sure-footed under hard braking as we’d have liked either. Still, the inclusion of ABS makes a world of a difference to confidence behind the wheel. Ride quality is good, if on the firmer side, for the most part and what also comes handy on patchy surfaces is the 180mm of ground clearance. 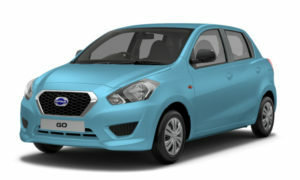 View offers on Datsun Cars from Datsun dealers in Hyderabad at Autozhop. Although engine noise is better insulated than before, the floorboard insulation still feels lacking as even the smallest pebble hit makes a sharp noise inside the cabin. Overall, the NVH levels have been improved to a point where it is now acceptable. As far as handling is concerned, it’s a car best suited for city use. The steering is light and lets you make quick turns or u-turns in traffic. However, the feedback from the unit feels a bit vague at high speeds and sudden lane changes doesn’t inspire much confidence. A slightly heavier steering would have gone a long way to help with that. Book a test drive for Datsun GO . The 2018 Datsun Go’s prices start at Rs 3.29 lakh (ex-showroom, India) for the base D trim. The mid-spec A, A(O) and T trims come in at Rs 3.99 lakh, Rs 4.29 lakh and Rs 4.49 lakh, respectively, and cost about the same as corresponding versions of the old car. Factor in the additional kit on offer, and what is clear is that the Go packs in far more value than before. The top-spec T(O)’s Rs 4.89 lakh price is also competitive, when you see the equipment it comes with. The changes to the Go make it feel significantly better than before. It feels like a more wholesome package and its appeal finally goes beyond the promise of low running and maintenance costs that Datsun has relied on to pull in buyers so far. While only a straight up comparison with the likes of the Tata Tiago and Maruti Suzuki WagonR will tell if it’s the best car for the money, the Go has certainly become far easier to recommend than ever before.